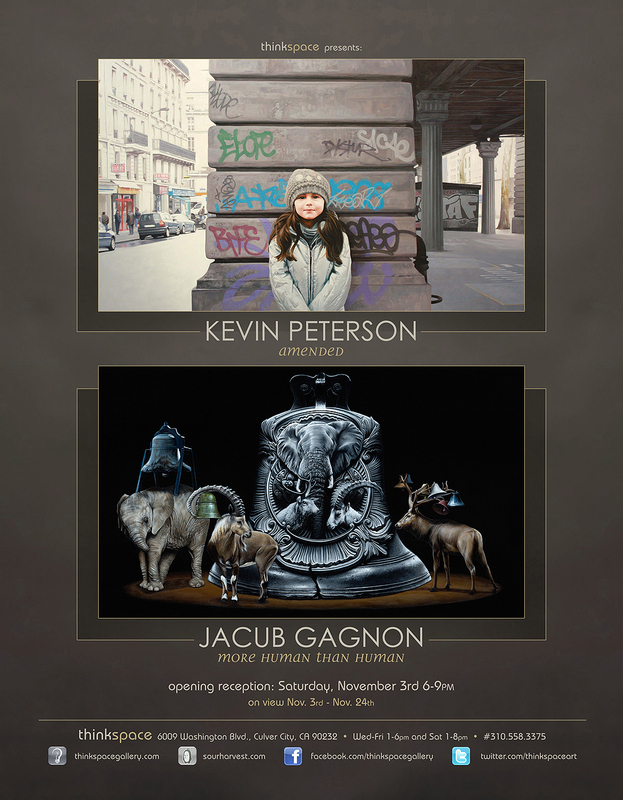 Thinkspace is pleased to present More Human Than Human, featuring new work by Canadian artist Jacub Gagnon in the solo gallery. Gagnon is one of Toronto’s emerging contemporary talents. 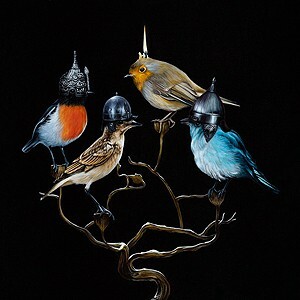 The artist’s paintings are composed of dramatic expanses of pitch black negative space, populated by colorful hyper-realist renderings of wildlife in whimsical situations. The little creatures of Gagnon’s imaginings surrealistically activate human objects with both absurd and adorable end results. Meticulously detailed and rendered, with the application of delicate layers, Gagnon’s colors and textures are jewel like. The artist’s scenarios are those of fantasy, summoned by an unfettered imagination and uninhibited by the restrictive logic of reality. Gagnon probes the fine line between the innocuous and the sinister, effortlessly subverting the order of the natural world. The work combines the preciousness of miniaturization with the whimsy of fantastical narrative. At times uncanny and dark in their unlikely combinations, the pieces activate unprecedented relationships between the animal and human worlds, and transfigure wild animals into anthropomorphic guises; like eerie little impostors of the human. We are seduced by a detailed and luminous surface, and fascinated by its circus of creatures. The paintings are almost Baroque in their drama and intensity, but undeniably contemporary in their aesthetic. Humor abounds in this land of carnival and inversion: scale is subverted, and natural relationships are defied. It is a world of disproportion and excess, as anything is possible, and nothing too perverse, in the descent down the rabbit hole. Gagnon deploys a trove of visual pleasures for the viewer, and creates a threshold into a world of boundless fantasy.